Orion Oaks County Park review, and info. Orion Oaks is situated on 900+ acres of land in Lake Orion with entrances located off Joslyn Rd & Clarkston Rd. Maintained by Oakland County Parks, Orion Oaks Country Park is open from sunrise to sunset and features 10 miles of trails for hiking, mountain biking and cross-country skiing. The trails are ungroomed in the winter for cross-country skiing and the park does not rent cross-country ski equipment. Fishing is available at the 90 acre Lake Sixteen situated just south of the Joslyn Rd, or Orion Oaks Dog Park entrance. Lake Sixteen offers wheelchair-accessible fishing and a small boat launch for mon-motorized boats. Swimming is not permitted. The Clarkston Rd entrance for Orion Oaks has a small, unpaved lot for easy trail access. A short jaunt from the parking lot is a path leading to a giant woodchip pile the country provides for Free Wood Chip Days. Archery-only deer hunting is permitted at Orion Oaks County Park from October through January 1 – all Michigan DNR rules apply for hunters. 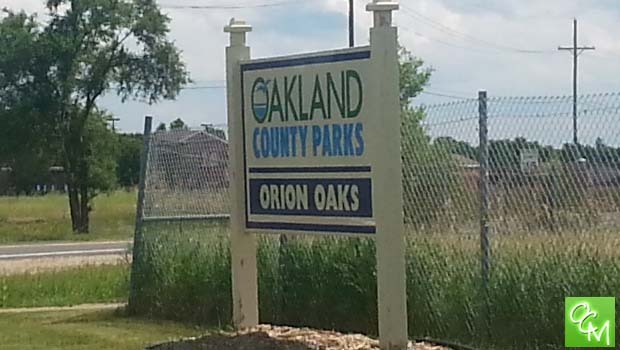 The most popular attraction Orion Oaks County Park may be the Orion Oaks Dog Park which features convenient access to the Orion Oaks County Park trails, swimming for dogs at Lake Sixteen, and modern restrooms for dog owners. Orion Oaks County Park offers plenty of wooded, wide-open spaces for hiking and other activities but isn’t necessarily a fun park for kids. If you’re looking for a nearby park with ballfields and a large playscape for kids, Friendship Park, maintained by Orion Township Parks and Recreation, fits the bill and is just west of Orion Oaks on Clarkson Rd. Orion Oaks is definitely more for nature enthusiasts than for parents with small children. Orion Oaks County Park does not have a gate attendant where you can purchase vehicle passes. Vehicle permits must be purchased prior to arrival. Vehicle entry rates are $5 for Oakland County residents, $12 for non residents, and $4 for seniors and active military. Advanced permits and yearly passes can be purchased at www.DestinationOakland.com. See related articles and posts below for more about Oakland County Parks and Recreation, Metro Detroit, Michigan parks reviews, pics and more.